You are buying one Victorian dollhouse wall shelf kit. Combined with a stylish k itchen cupboard that gives you plenty of storage to accent any dining space. Half scale dollhouse boat shaped bookcase kit, laser cut and ready to assemble. Engraved backpiece. 1:24 Scale. Natasha Beshenkovsky. 1:24 scale Natasha Beshenkovsky's Mini Decoupage. It's a double treat because Dana is there giving a class! She even gives a quick lesson on curling hair for your mini dolls! Check it out! 1:24 Scale. This is 1/2 the size of a "standard" dollhouse item. Detailed scale model for adult collectors. Not intended for children under 14. TB3, HOLIDY VILLA. Enjoy the leisure life of the villa . DOLLHOUSE MINIATURE DIY KIT. W/ 7 LED LIGHTS, MUSIC BOX. TWO STORY, SWIMMING POOL. Detail instruction is enclosed. Although the original manual is written in Chinese. The Franklin doll house kit. 124 features 9 spacious rooms. 2 curved staircases. Wraparound porch. Elegant balcony with French doors. Great project. You are buying one dollhouse Adirondack Chair kit. 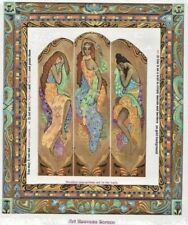 Chair design is the exact miniatures of the original 1900's design 1-1/4 “W x 1-5/8" H x 1-1/2 D.
Natasha Beshenkovsky. It's a double treat because Dana is there giving a class! She even gives a quick lesson on curling hair for your mini dolls! Check it out! Decoupage is typically applied to wooden furniture pieces: tables, desks, chairs, chests, screens, and boxes. Scale: 1:24. Total Furniture: Five (5) pieces. Furniture set with accessories: kitchen cabinet, tea set, toaster oven, dining table, chair, baby chair, etc. Babies from each family can sit in the baby chair. This is 1/2 the size of a "standard" dollhouse item. Laser cut on Japanese cotton acid free paper. These are the leaves to make a coleus plant. You will need 30g paper covered wire, white glue and acrylic paint. No written instructions. There are many other uses for these leaves. You will receive all components for the box and the facade, just add paint and glue facade to plexiglas. The Art Deco Facade is laser cut from 1/16" maple. 1:24 Scale. This is 1/2 the size of a "standard" dollhouse room box. Laser cut on Japanese cotton acid free paper. These are the leaves to make a bleeding heart plant or a bonsai tree. You will need 30g paper covered wire, white glue and acrylic paint. Have a favorite hockey team and want your smaller dollhouse miniatures to show your support?. Then this wooden unpainted hockey stick with puck will help your achieve that goal. These are designed and created for that very reason. It's a double treat because Dana is there giving a class! She even gives a quick lesson on curling hair for your mini dolls! Check it out! Decoupage is typically applied to wooden furniture pieces: tables, desks, chairs, chests, screens, and boxes. Laser cut on Japanese crepe acid free paper. This is the size you need for a half scale gladiola calyx. Also use as tiny leaves. 1/2" to 1'. 1:24 Scale. This is half the size of a "standard" dollhouse item. Made of 1/16" maple. Cut mirror material to size. Laser cut mirror for your 1/2 Scale miniature scene. 2009 EPOCH CALICO CRITTERS COMPLETE LIVING ROOM FURNITURE SET. SET IS NEW IN BOX. WITH WORKING FIREPLACE AND OVER 40 ACCESSORIES! ADD THIS TO YOUR COLLECTION! 2009 EPOCH. 1:24 Miniature Dollhouse Diy craft kits, Room Box, My little buddies (Pink), M006. My little buddies (Pink) –(M-006) (show photos). 1:24 Wood Miniature Dollhouse Diy craft kits. Those are all handcraft kits (not be assembled), and includes all materials (such as wood chip, plastic, fabric, wire, light bulb, paper….). 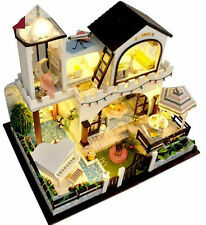 1:24 Wood Miniature Dollhouse Diy craft kits Our Tea House, #C005. 1:24 Wood Miniature Dollhouse Diy craft kit. Our Tea House, #C005. One Coffee bottle with 2 cakes in dish (see photo above). Those are all handcraft kits (not be assembled), and includes all materials ( such as wood chip, plastic, fabric, wire, light bulb, paper….). Laser cut on Japanese crepe acid free paper. This is the gloriosa flower reduced to 1/2 scale. Includes over 10 furniture pieces ~ Over 15 Pieces in all! For children ages 3 and up. Dining Room Set. Calico Critters. Half scale dollhouse standing trellis kit, laser cut and ready to assemble. Includes eyelets and chain. 1:24 Scale. This is 1/2 the size of a "standard" dollhouse item. Combined with a stylish kitchen cupboard that gives you plenty of storage to accent any dining space. Made by Laser Dollhouse designs Inc. House is in 1:24 scale. Features three large room with French doors for the main entrance and detailed porch. Dollhouse toy box kit, laser cut and ready to assemble. Has the word TOYS and a bear engraved on the front. 1:24 Scale. This is 1/2 the size of a "standard" dollhouse item. Kit DOES NOT include hinges for the top. It's not a finished product, it's a DIY kit including all the materials you need to build this dollhouse showed in the picture. Miniature DIY Doll House with Handmade Furniture ~ Do it Yourself Mini Doll House. Laser cut on Japanese crepe/cotton acid free paper. You will need paper covered 30g wire, acrylic paint and white glue. I did a youtube video on painting laser cut floral sheets if you would like tips on painting. (ebay won't let me copy the link here). Add leaves (sold separately) and plant in pot or garden. For tips join my facebook group called Making Dolls house flowers in all scales. SHIPPING OVER PAYMENT WILL BE REFUNDED. Laser cut on Japanese crepe/cotton acid free paper. You will need paper covered 30g wire, acrylic paint and white glue. DIY WOODEN DREAM DOLLHOUSE –A-029, Creek Aegean Sea Villa. MINIATURE DIY KIT. REMARK: DIY item requiremore patient andskill of handcraft. If you haven't try any DIY item before. Back to Top. Every item shown in the picture needs to beASSEMBLED, it needstep by step to use thoseraw. 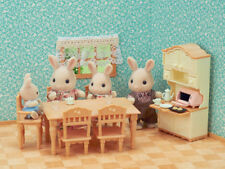 Calico Critters Dining Room Set. New in Box. Includes 15 pieces. Half scale dollhouse serving tray, laser cut and ready to assemble. 1:24 Scale. This is 1/2 the size of a "standard" dollhouse item. Laser cut unfinished pig shaped rocker kit for your miniature nursery scene. 1/2in to 1ft. 1:24 Scale. This is half the size of a "standard" dollhouse item. Made of 1/16" maple. Detailed scale model for adult collectors. Laser cut unfinished curved top peg rack kit for your miniature scene. 1/2in to 1ft. 1:24 Scale. This is half the size of a "standard" dollhouse item. Made of 1/16" maple. Paints, stains, varnish and glue not included. Every furniture has a tiny magnet on the back and you can use them as a fridge magnet. Scale: 1:24 Miniature Dollhouse. 1:24 Miniature Dollhouse. For Dollhouse Decor of Livingroom, Bedroom, Diningroom,Study Room, Sewing Room, Bath Room, etc. Calico Critters #CC2263 Deluxe Living Room Set. Calico Critters Dining Room Set. Condition is New. Shipped with USPS First Class Package (2 to 3 business days). Dollhouse Miniature Electric PETITE Outlet Power Strip. These outlets work with the PETITE Plugs. These outlets work with tape-wired structures. Natasha Beshenkovsky. 1:12 scale Natasha Beshenkovsky's Mini Decoupage. It's a double treat because Dana is there giving a class! She even gives a quick lesson on curling hair for your mini dolls! Check it out! YOU HAVE TO ASSEMBLY. NO GLUE INCLUDED. INSTRUCTION IN ENGLISH.